It’s one of the most surefire ways to build links: just get enough experts to take part in a group interview. They will share the post to their respective audiences and the links will follow the social media success. Can you simplify that process? How can you ensure the support of others by involving them without significant time and effort spend? So after a month or so of preparation and countless hours spent on the whole procedure you finally got that expert round-up and that’s it. You used up all your time for blogging by allocating it to this one article. Now you need to do other work, probably one where clients pay you. So how exactly can you mimic the whole success of group interviews without actually having to perform that many tasks? I already suggested to use data to automate such group “link bait”. This only make sense for companies that have at least a graphic designer and programmer to use data for that purpose correctly. You can achieve that on a budget as well without a whole team. Just think about the people who need to become aware of you. Just search their blogs or social media history for example using Topsy or Google+ search. 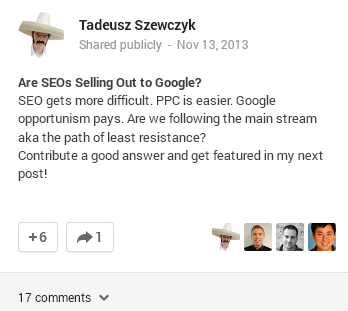 On Google+ simply add the name first and then the keywords: [tadeusz szewczyk link building]. You can crate a post on “100 experts on link building” with ease because everybody in the search marketing field has written about that topic. Just collect the most intriguing or insightful quotes, link to them and add an avatar of that person by simply taking it from a social site. Crowdsourcing will only work in case there is actually a crowd. I have done it a lot in throughout the years even before I knew that you call it crowdsourcing. I wasn’t born a well known blogger so I had to build that audience first by engaging with people a lot and by showing some expertise and publishing a blog first. all the time or you don’t really exist online. So once you have enough people who not only listen to you but actually reply you can also ask them a question on Twitter or Google+ and compile a list of answers. These people do not have to be accomplished “experts”. Those not yet popular will be even more likely to take part. Some of them will become experts sooner or later, others are already but nobody knows yet. Some people are simply from the other end of the world so they may be unknown in your area but in their country they might be well established already. Not every post can be about others. Quite often you need to express what you want to say not what other people think. It’s good to overcome the common egoism of constant self-promotion but once you’re over it you need to find a balance between third party contributions and your own ones. The best was to reconcile your own writing with the opinion of experts is simply linking out to them whenever it makes sense. Over the years I have noticed a significant upsurge in popularity of posts that link out compared to those that just cover a topic from my perspective. Linking out within the text only makes sense when you want to prove your point by pointing towards someone else who already said that and explained it in depth ideally. Otherwise it’s better to add additional outside resources below the article so that you don’t break the flow of reading. Remember that people who click an outgoing link might never return to your post even in case you open the link in a separate tab or window. That’s advisable but won’t prevent distraction of your readers. So adding “read more” resources at the bottom of your article may be a better idea in many cases. It depends on the intent of your article and outbound link of course. Refer to people by name, e.g. 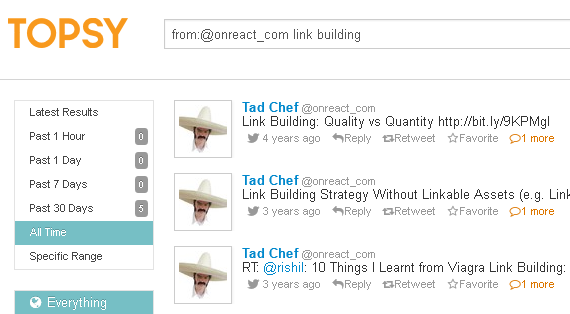 “Tad Chef of SEO 2.0 says that” because they are more likely to notice you and be thankful then. Do not solely refer to brands or sites. When you refer to @sejournal your chances are far smaller to get some reply or engagement compared to referring to the actual author of a piece on Search Engine Journal. Companies or websites do not reply usually, people do. Involve your peers not famous influencers who won’t even notice you among the myriads of other fans. Link out to bloggers by using deep links to their actual posts, this way they will see a pingback in their WordPress backend. Do not just link to the homepage without a lot of context. Make sure to refer to a specific post and text passage. Notify those involved via social media mentions when you publish the content they are involved in. My name is Tadeusz Szewczyk but most people know me as Tad Chef. I help people with blogs, social media and search both in German & English. I also write about these for weblogs from around the world and my own blog over at seo2.us This is my virtual return to my place of birth, Poland.